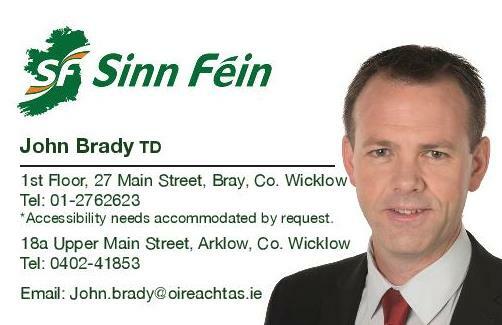 Sinn Féin TD for Wicklow/East Carlow John Brady has called for additional security measures to be put in place at the Florence Road carpark in Bray after an incident of serious vandalism occurred on Wednesday night. “On Wednesday night, eleven cars were vandalised in the carpark on Florence Road. This was a shocking act of destruction to cars that were parked there overnight. “I understand that the level of damage to one car was so extensive that the car has had to be written off with all eleven cars having their windows smashed. “This was an appalling crime to peoples’ property and I utterly condemn these actions. “I am calling on Bray Municipal District to review security in the carpark to ensure that an incident such as this is not allowed to happen again. I have raised issues in the past as regards lighting in the carpark and while, this was improved, the Council must go further. “When we have a situation where communities are left without adequate Garda presence and resources, we have no choice but to invest in additional CCTV and security measures to protect people and their property.